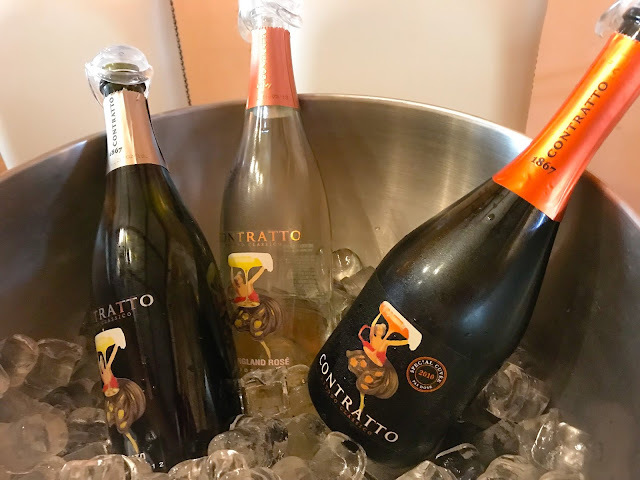 When you think of Italian sparkling wine, I’m going to guess that the first thing that comes to mind is Prosecco, or maybe Moscato. So it might be a surprise to find out that Italy’s oldest sparkling winery makes their wines in the traditional method (i.e. in the style of Champagne). ‘Oh, of course!’ some of you might say, ‘In Franciacorta!’ Nope. Contratto, Italy’s oldest operating sparkling winery happens to be in Piedmont–the same region that’s better known for burly reds like Barolo and Barbaresco, as well as Barbera and Nebbiolo. 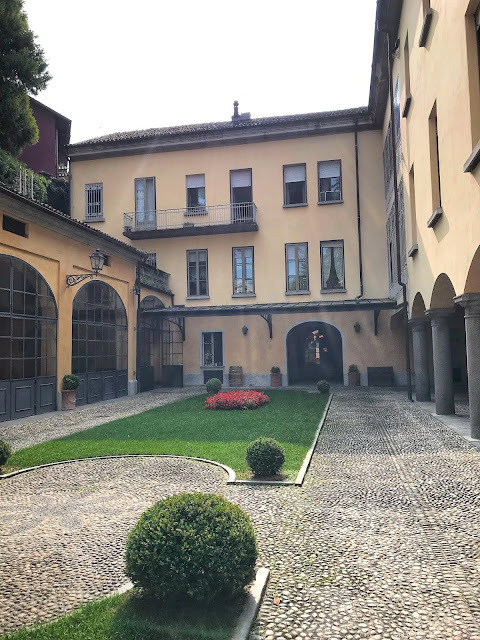 Contratto dates back to 1867 when Giuseppe Contratto moved to the town of Canelli in Piemonte and started building his winery. Conttrato had moved from Aosta, a tiny region that borders France, so it has always had a lot of French influence. It stands to reason that Contratto would have come across French wines there. 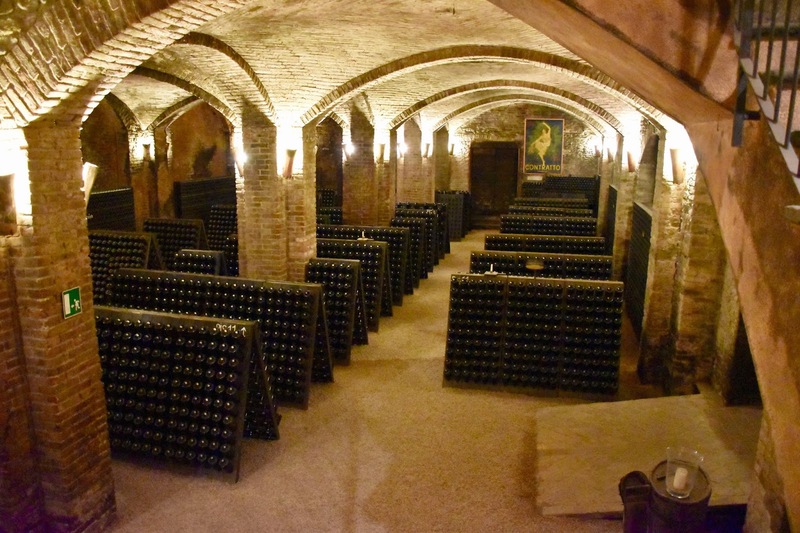 In any case, he fell in love with Champagne, and he got it in his head to make wines in the Champagne-style in Italy. 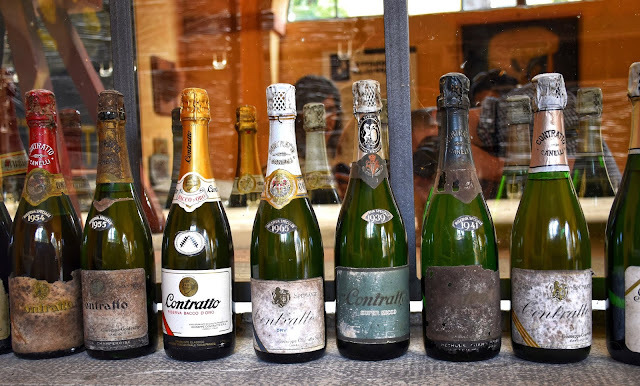 150+ years later, the winery he started is still making bubbles. 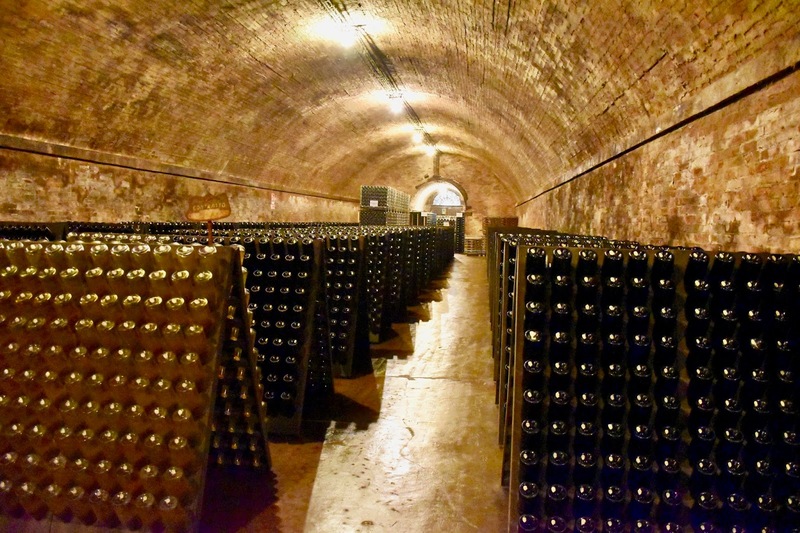 With so much history, the winery was named a UNESCO World Heritage Site in 2014. 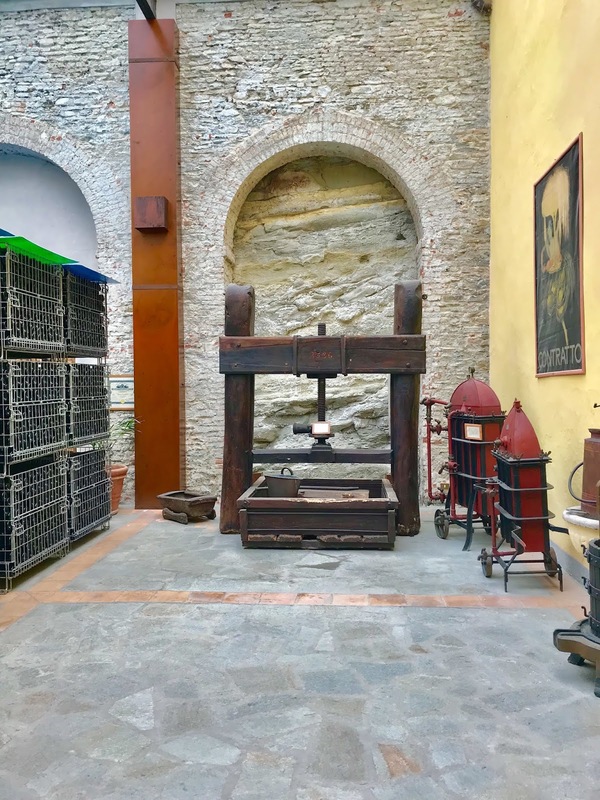 Antique wine press at Contratto. 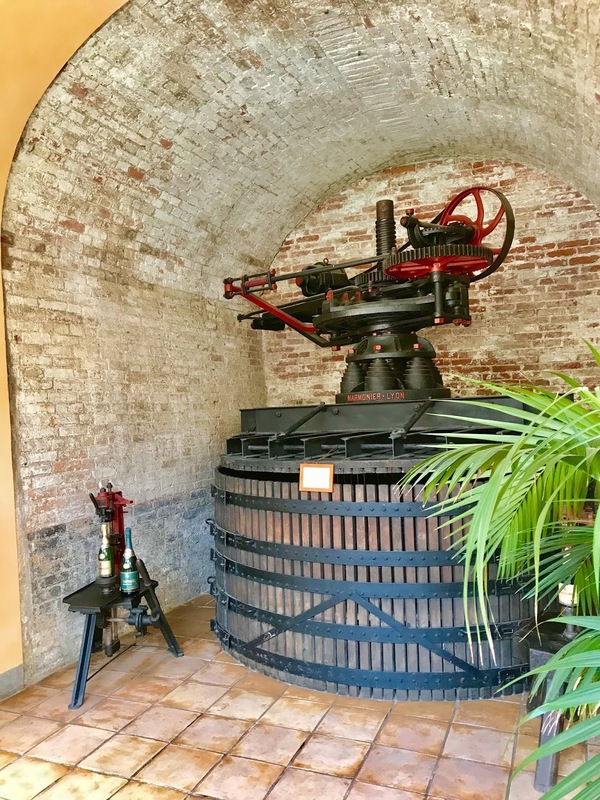 Greg and I had the chance to visit on our recent trip to Italy and tasted through several of the wines. We will definitely get to the wines and pairing suggestions in a bit. However, the tour itself was really fun and fascinating; so before we get to the wines I’d like to invite you on a little photo tour of the winery. I highly recommend going if you’re ever in the area! 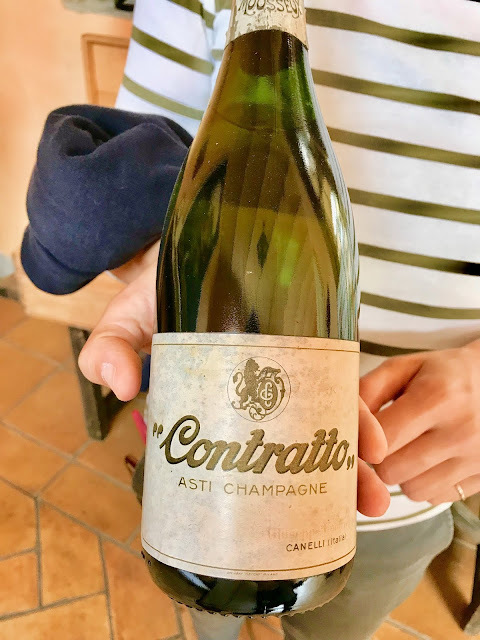 Antique bottle of Contratto "Asti Champagne." 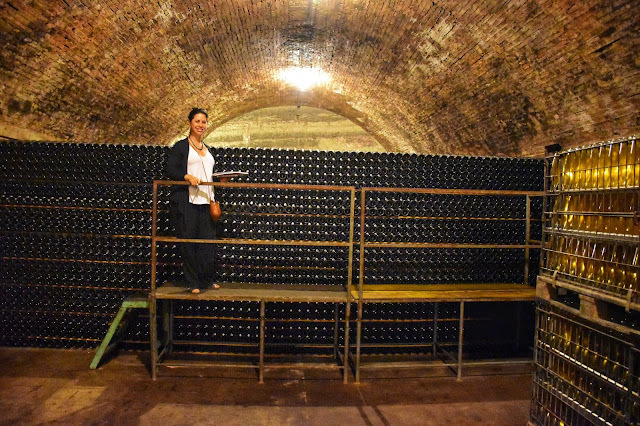 Canelli is in the province of Asti, which is known for making wine from Moscato grapes. Therefore, in the beginning, Contratto made its wines using Moscato grapes and called it “Asti Champagne.” The term was used until 1941, when the region of Champagne won the sole right to use the term “Champagne.” The winery continued to make traditional method Moscato regularly as part of their range until 2007, but now it’s only occasionally made in small batches. You might be thinking, “Moscato? Isn’t that sweet?” Well yeah, usually; but at the time this was very much in keeping with the Champagne style since most Champagne at the time was sweet. 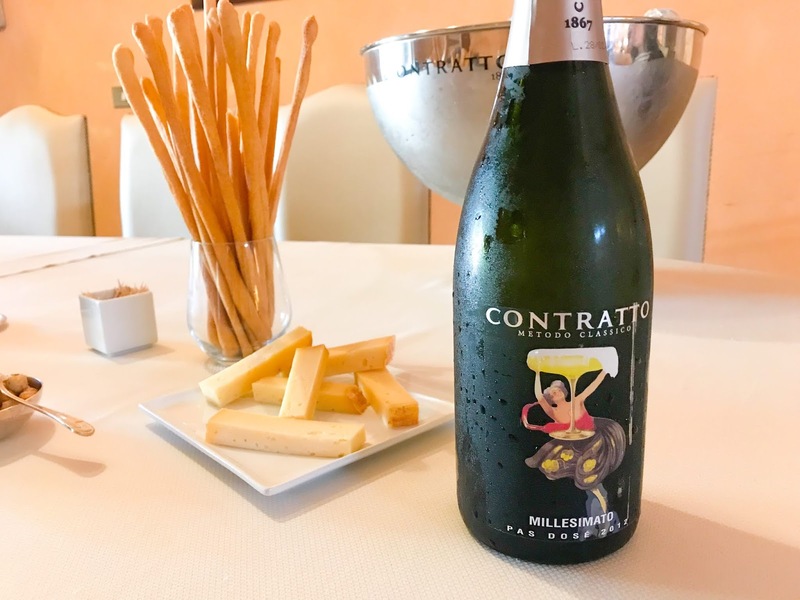 For a while, Contratto also experimented with using other typical Piemontese grapes like Barbera and Nebbiolo for their sparkling wines, but eventually moved into using the international sparkling grapes, Pinot Noir and Chardonnay. Here we have a line up of old Contratto labels. 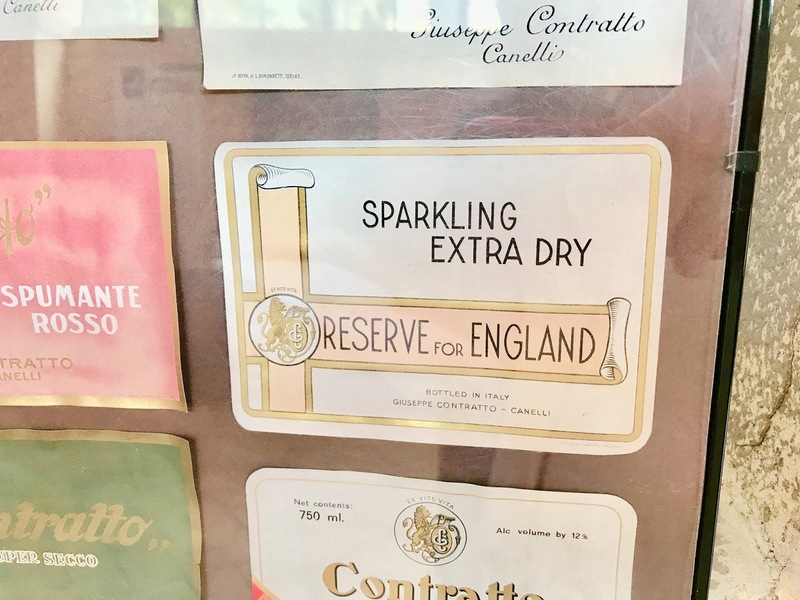 Just as in Champagne, the English market drove the preference for drier styles of sparkling wine. For a long time, the British Empire was Contratto’s largest export market. In 1930, Contratto created a wine called "For England" to suit their tastes. (The winery says this wine was was less sweet than its Champagne counterparts at the time.) 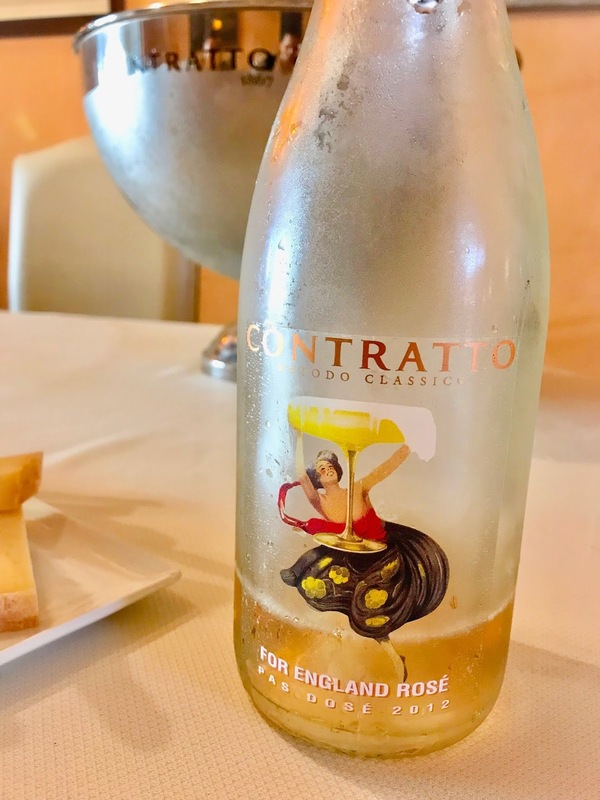 Today, Contratto makes white and rosé “For England” cuvées. Look at all those bottles! Our guide Elisa calls this her “favorite sea" and I can see why. Here’s a shot with me in it for scale. If you ever wonder why traditional method (or as it’s known here, Metodo Classico) tends to be so expensive, well . . . you’re about to see many reasons. 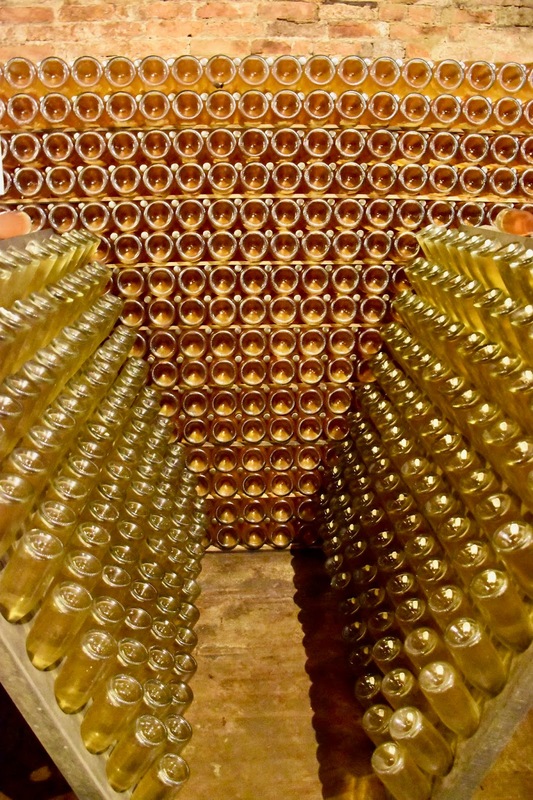 One is that after the base wine is made, the second fermentation that makes the wine sparkle has to happen in bottle. Then you have to wait around while all the lees (or yeast cells) that perished creating all the bubbles, lend their yummy, toasty flavors to the wines. All those bottles take up A LOT of space. 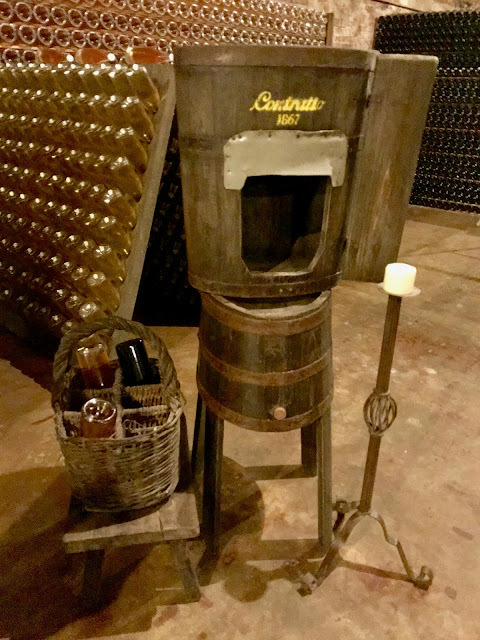 The Contratto family ran out of room in the original winery space in 1898. They expanded by digging into the hills behind the winery. This turned out to be a great thing, because the underground caves keep temperatures nice and constant. This is what a traditional method wine looks like after all those yeasts have done their job. Not the pretty, clear bubbly you’re used to right? 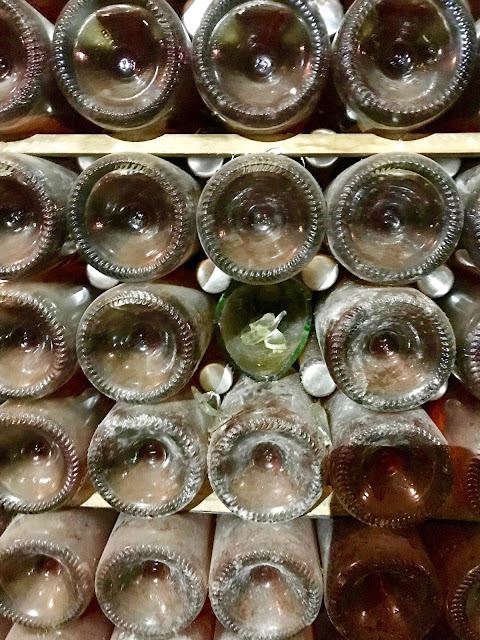 To get the wines nice and clear, the bottles are slowly turned, little by little, in a process called riddling (developed by the Veuve Clicquot) until all the lees are trapped in the neck of the bottle. Contratto bottles on riddling racks. At Contratto, this is all done by hand, by one guy. His name is Mauro and he has been doing it for 40 years, since he was 16 years old. He can riddle 300 bottles per minute! I was assured that Mauro has no issues with carpal tunnel. One also has to wonder what will happen when Mauro retires. 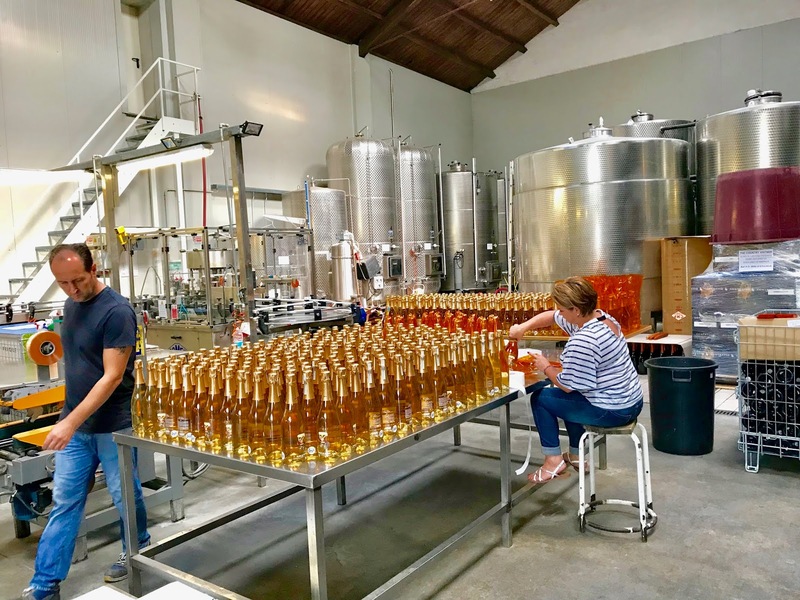 Once the lees are trapped in the neck of the bottle, you still have to get them out to get a clear wine. 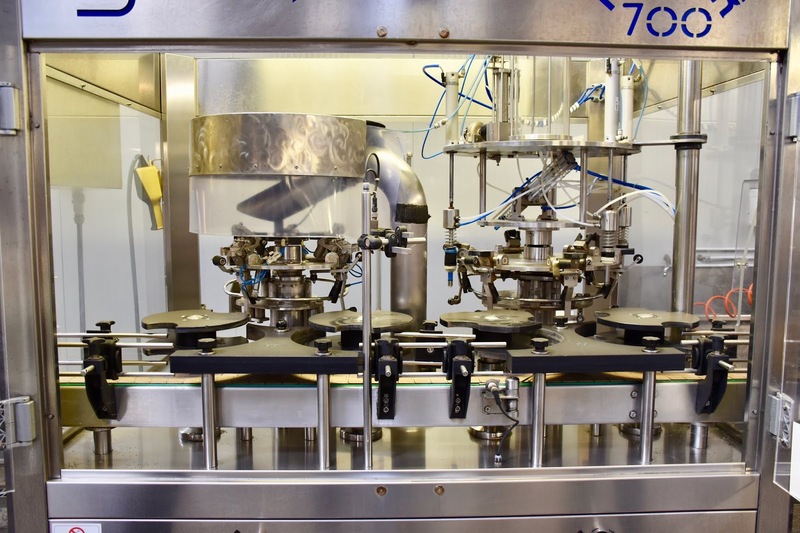 This process is called disgorgement. Nowadays, the neck of the bottle gets frozen (usually by dipping it in dry ice or some variation) to create a little “yeast-cicle,” as I like to call it, which then gets popped out. In old times, the disgorgement occurred in this contraption above. Nothing went to waste, though. The wine that shot out in the process was then collected and used to make Vermouth. 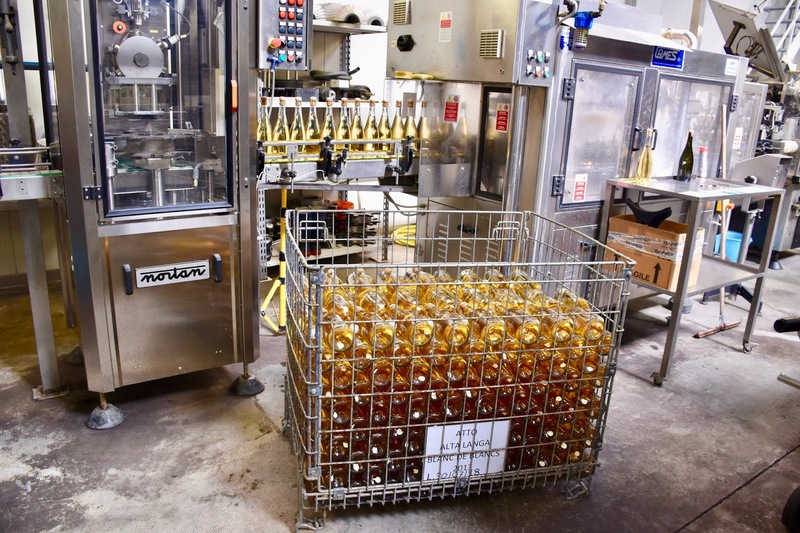 More modern machinery is used for disgorging and corking the bottles these days. Once the wine is disgorged, the bottle gets topped off with more wine prior to being corked. The wine is then ready to be shipped. However, Contratto feels that the light that can come in through their clear glass bottles that is used for some cuvées is not good for the wine. So before shipping them off, Angela here wraps the bottles to “give them sunglasses” for protection. 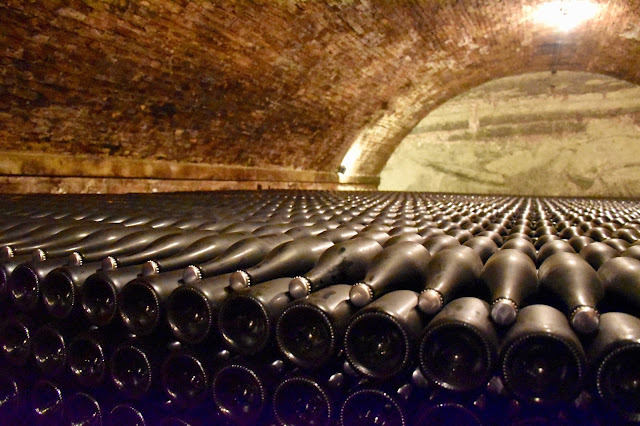 Altogether, each bottle is touched no less than 30 times by human hands, and more in the case of certain cuvées. This is the oldest part of the winery, which they call “the Cathedral.” The cellars were restored in 1993/1994. 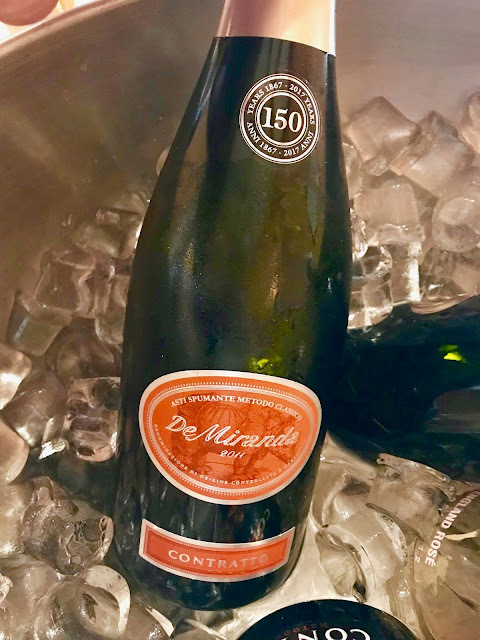 Modern sparkling wine really couldn’t exist until the technology existed to make glass strong enough to contain all that pressure in the bottle. Before that, making bubbly was a dangerous proposition. Even today, explosions still occur. 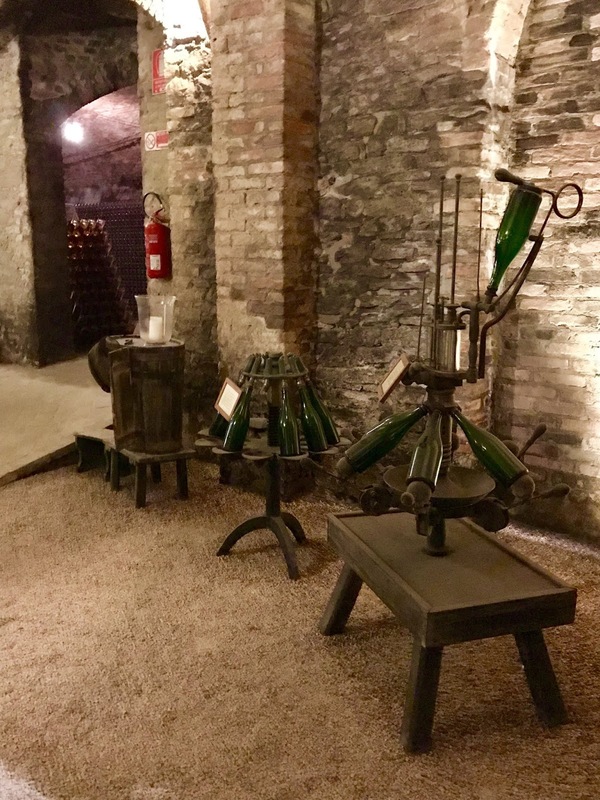 Just a few more old-timey contraptions for making sparkling wine. As you can see, a lot of care is taken in making these wines. In addition, they use sustainable farming practices for growing the grape, and natural yeasts are used for both first and second fermentations. You’ll also find the disgorgement date on the capsule of each bottle. Contratto says their wines can be drunk for 10+ years. Now for the wines! We also discussed pairing suggestions with Elisa as we tasted through. - Minimum 48 months on the lees. - No dosage. Only wine is added in the final top off. This is the case for all of today’s wines. Tasting Notes: Ripe pears, biscuits, toast, a little tangerine, and a hint of salty lemon. It has a round body and finish coming from the Pinot Noir. Pairing Suggestions: Great with fried chicken! This one is very all-purpose and complements anything with a fatty component. It works really well with spicy foods. Of course, this being Italy, pizza is also recommended. It was lovely with the salami that was served alongside our tasting. This is also a great match for seafood, as would be the case for all of today’s wines. Elisa recommends leaving this one in bottle for a bit. 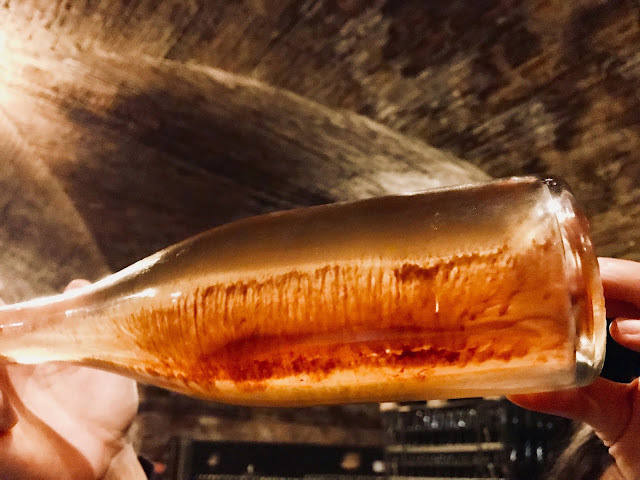 She noted that the wine is really beautiful immediately after disgorgement, but then needs a little time to come back together. - Only free run juice is used and the wine spends about an hour on the skins to achieve the pale salmon color. - Minimum 32 months on the lees. Tasting Notes: Peaches, blood orange, gold and pink flowers, cherry, and brioche. Pairing Suggestions: Elisa noted that this is awesome with salmon on a bagel with cream cheese and capers, so bust it out for brunch. Or try my salmon and goat cheese gougères. It was delicious with the toasted hazelnuts on the table. It’s also a good match for carne crudo, as well as the traditional Piemontese appetizer, Vitello Tonnato. Stay tuned–this is coming up in my next post! This is a new cuvée. Its first bottling was in 2009. - 95% Pinot Noir/ 5% Chardonnay. All old vines. - This wine spends 7 years on the lees. - Price: I couldn’t find price info for this wine as it is probably still too new a cuvée. This wine nows falls under the Alta Langa DOCG, which is a new DOCG created in 2011 to focus on traditional method sparkling wines in Piedmont. Tasting Notes: There’s a hint of gunpowder with lots of super toasty notes coming from all that extra time on the lees. Fruit notes of baked peaches, baked pears, and gold apples. Hints of toasted nuts, deep golden flowers, and salted butter. Pairings: We’d been enjoying an aged Castelmagno cheese, an ancient style of Piemontese cheese. (The winery is actually a partner in producing one.) It worked with all of the wines, but it went to another level this aged bubbly. Beyond that, this is this is a sparkling that can stand up to some meats as well. Crudo and carpaccio for sure, but possibly even a steak, or an Italian Bollito Misto. This was a very special treat. Remember I said that they still make limited quantities of the traditional method Moscato? We got to taste a bit from the very last bottle they had of the 2011. - 100% old vine Moscato. - Free run juice only. - The first fermentation is halted at 5.5% ABV. It goes through a long second fermentation for 4-5 months until it reaches 7% ABV, making this a sweet cuvée. At that point the fermentation is halted again by a drastic chill down. - The wine spends 4 years on the lees while held at very cold temperatures. Tasting Notes: Orange blossoms and honey. It was surprisingly delicate with creamy, silky mouthfeel like satin. Lots of pastry notes and an array of dried tropical fruits, stone fruits, and candied citrus. Pairing suggestions: This wine was also magical with the Castlemagno, but in a very different way from the Special Cuvée. I’m sure it would be just as amazing with other strong cheeses. Of course, this is also an ideal match for fruit dessert. How’d that Barolo get in there? 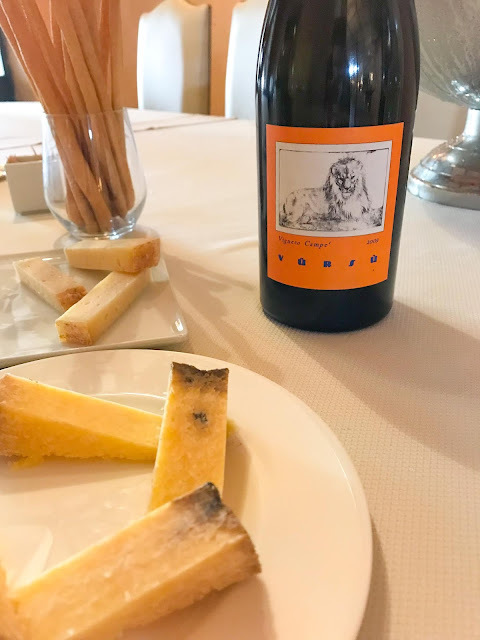 Giorgio Rivetti, the owner of La Spinetta, bought Contratto in 2011 from Bocchino, Canelli’s distillery, after consulting for the winery since 2007. The Contratto family sold him the winery in 1993, but they remain connected as members of the family still live on the property. - 100% Nebbiolo. Average age of vines is 50 to 55 years. Pairing Suggestions: Richer meat dishes like braised beef, osso buco, and game. Contratto bottles on riddling racks in their caves. Photo by Greg Hudson. Photo credits on today's pics split between Greg Hudson and Nicole Ruiz Hudson. We've been on a role with the bubblies lately. Check these posts out for lots of inspiration for the holiday season! 4-Layer Caviar Dip with Potato Chips and Other Happy New Year's Appies! 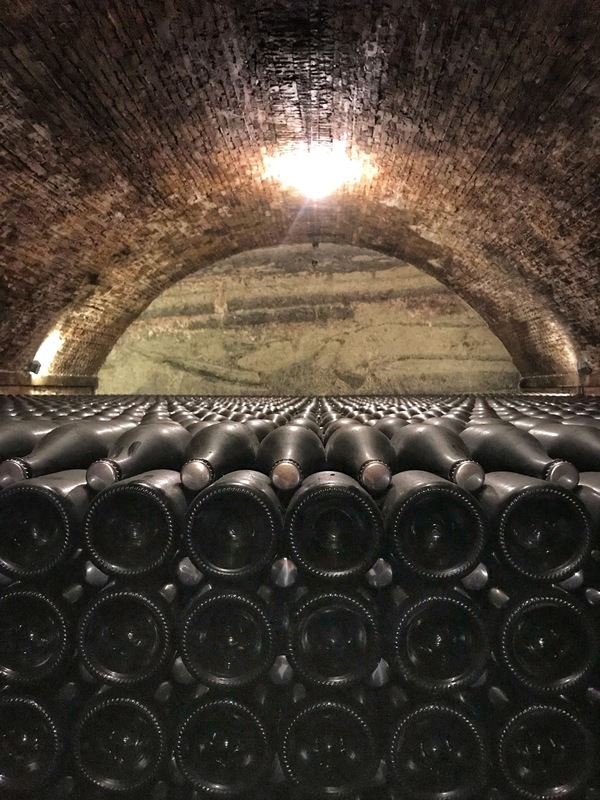 The rest of the Italian Food Wine Travel Group (#ItalianFWT) is exploring sparkling wines from Italy. The group meets on Twitter the first Saturday of every month. Feel free to join the chat simply by following the #Italianfwt hashtag on Twitter this Saturday, December 1st at 11am ET/8am PT. Beautiful post! Now I just need to see if I can get my hands on any of those wines. They look so intriguing. Thanks for sharing. I know! I was too!!! Your article makes me want to put Piedmont on the top of my "to-visit" list. What a great visit you had. Contratto sounds like a special place! It really was a delightful visit! And the Piedmont is so beautiful in general. What an enjoyable post! I feel as though I've just taken a tour of the Contratto winery and tasted through all of their wines. And I didn't mind at all that a Barolo sneaked in at the end! Amazing! 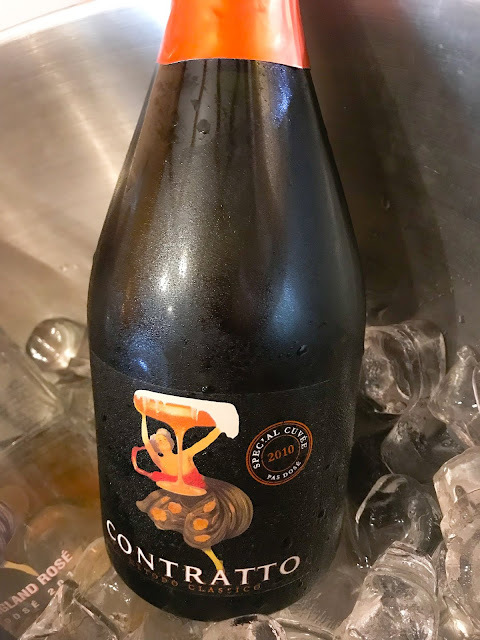 love your post and want to get my hands on some of these Contratto wines!! Wow! What a tour and it sounds like they make wonderful wine. Is it available in the US? Yes, several of them are. Where possible there are Wine Searcher links included. I believe the Millesimato Pas Dosé is the easier to find option in the Bay. What a great tour into Contratto. I'm always surprised how people view Italian sparkling wines and just don't realize the quality of some of the areas producing such fabulous bubbly.